There’s no arguing that today’s political climate on the international stage has changed drastically since Donald Trump’s rise to power, as even those states that used to describe themselves as allies have a much harder time working together that they used to. Those difficulties become particularly visible in the relations between Washington and a number of European capitals that have been trying to lead the EU through troubled waters in the aftermath of the Brexit vote in the UK. However, these attempts have been a source of constant frustration among American elites as those are determined to reinforce Europe’s subordinate position, regardless of the price they are to pay in the process. It is for this very reason that Washington would wiretap all of the leading European figures in a bid to prevent them from establishing a common anti-American front. German chancellor Angela Merkel has been under constant surveillance of the National Security Agency (NSA) for years now, as it has been revealed by a number of media sources. However, she’s not alone to attract that kind of attention from the US, as American intelligence agencies would try to record every discussion that leading political figures across the EU would have. Of course, it goes without saying that those attempts are illegal. Due to a series of recent revelations made by WikiLeaks, we are now aware that none of the French presidents in modern history managed to escape the attention of the NSA, as it would spy on Jacques Chirac, Nicolas Sarkozy and Francois Hollande. According to BFM TV, it’s most likely that Washington established its surveillance center at the territory of the US embassy in Paris, in the immediate vicinity of the Elysée Palace. It’s clear that the goal of suppressing the revolutionary urge of French politicians has been a top priority for a number of American intelligence agencies. They would establish a tight grip over their actions and their statements to prevent France from rising to prominence. For sure, Emmanuel Macron couldn’t escape this fate, in spite of the fact that he’s a protégé of the Rothschilds. To be more specific, he was working for the family branch that settled in France due to the efforts of Baron Edmond Adolphe de Rothschild. These efforts resulted in the Rothschilds establishing Groupe LCF Rothschild in 1953, a private bank that would soon become the driving engine of international banking investments. 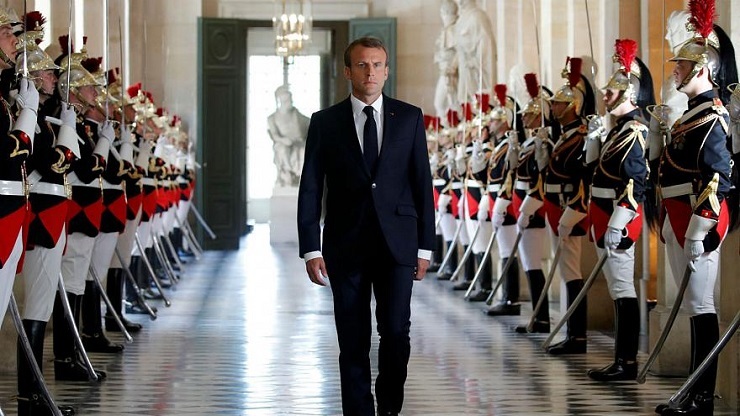 Those people that brought Macron into the Elysée Palace made sure that he would pursue a very specific outlook on the situation within the EU, as he offered Germany and the rest of the union to approach the crisis of mismanagement within the EU and the rise of European skeptics from a completely different angle. In particular, he made a number of statements on Brexit, along with supposedly anti-European steps of Hungary, the Czech Republic, Poland and Italy, which in his opinion were hijacked by the so-called populist movements. What most of these states had in common was their generally hostile opposition to Brussels paired with a loyal approach to Russia. Unsurprisingly, in a number of speeches that Macron delivered last year, Russia would be described as a force that is destabilizing the continent. However, upon his ascension to power in France, where he was supposed to become a backbone of Trump’s policies in Europe, Macron started demonstrating his independence from the United States, by disagreeing with the sitting American president over a number of issues. This became particularly obvious in an interview Macron gave to the Fox News on April 22, 2018. To support his position, last summer France’s foreign minister, Jean-Yves Le Drian announced that the EU was prepared to fight Trump’s efforts to “destabilize” the EU. This statement was followed by the sharp criticism of Washington’s trade policies voiced by the French minister of the economy and finance, Bruno Le Mayor. He would also urge the European Union to respond to Washington’s actions with a united response. As it’s been pointed by yet another prominent French political figure, Benjamin-Blaise Griveaux, France does not share the same civilization model with America and it doesn’t share its values. It’ safe to say that Emmanuel Macron has made a lot of steps to make those behind-the-scenes masterminds of American foreign policy decide that he has overstayed his welcome. For instance, he would criticize the influence that Washington still enjoys in Europe after speaking at the 73rd session of the UN General Assembly, stating that there was an acute need to strengthen the economic sovereignty of the EU. At a big risk for himself, Macron has also radically changed his position on Moscow after paying a visit to St. Petersburg last June. After this visit he decided to fulfill the old French tradition of building alliances with Russia, the trend that was immediately spotted by political analysts and Americana policymakers. In recent years, Russophobia would take center stage in foreign policy designs of the United States. However, during this year’s annual address to the French ambassadors, Macron urged his foreign ministry to review its approach to Russia for the sake of strengthening of European security. Then, Macron would note that Europe should not rely on the United States, taking the matters of defense and security into its own hands. For sure, none of these steps would go unnoticed by the White House, which resulted in a plan to show the young French leader “his place” before he makes any progress in his designs. The war of words on Twitter was, perhaps, for some time the harshest step the American president would take. However, after the commemorative ceremony of the 100th anniversary of the end of WWI, which took place on November 11 in Paris, Donald Trump made yet another attack on Emmanuel Macron after the latter proposed the idea of creating a separate European army. Trump said that an American ally in Europe (meaning France) would have suffered defeat in both world wars if it had not been for the military support provided to it by the United States. But when the war of words failed, Washington proceeded to yet another manifestation of its discontent with the policies pursued by the Elysée Palace – an outbreak of protests across France that are clearly being staged by an outside force. For sure, Yellow Vests have every right to be frustrated as one’s day to day life in France remains marred by socioeconomic challenges. It is not so much about the infamous fuel tax, as even before it was announced French doctors and nurses publicly expressed their outrage over budget cuts on education and medicine. The police union have also been frustrated with the steps the government takes for a long while. It is also noteworthy that protests started with social demands, while the demands to take down the government came much later, as the Fifth Republic remained reluctant to yield to the behind-the-scenes demands put forward by the White House. It’s also particularly curious that any such provocation staged by the United States and Britain would typically be accompanied by a media campaign, aimed at distracting the public opinion from the real perpetrators of such protests. This time was no different, as Ukrainian intelligence agencies in a bid to please Washington tried to misguide French media sources into searching for a Russian trace behind the protests, but no evidence of Moscow having anything to do with it has been presented to them so far. However, it is unlikely that this episode of blatant US meddling will succeed in influencing the future policies of France and the EU. Especially in the light of a manifesto put forward by a group of 120 intellectuals and politicians from 16 countries that was published by Le Monde. This manifesto offered a new architecture for the European Union to adopt, aimed at the formation of more democratic institutions within the Union and the transformation of Europe into a real global power.